A little while back I received an email from my ultra talented friend Jeannie Dukic of Jewelry By Jeannie. 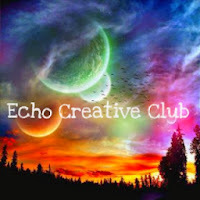 Some of you may remember last year when I participated in Jeannie's Design Group, the Echo Creative Club. 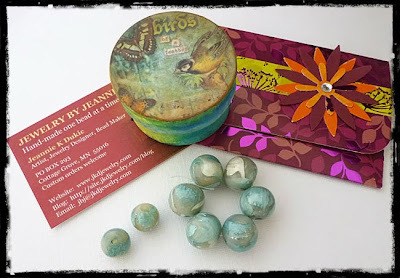 Jeannie makes fabulous beads (and really cool jewelry too, by the way), and not just any beads, but super great, polymer clay beads. I had never really worked with Polymer clay beads or pendants in my designs before Jeannie asked me to design with hers last year and wow, what a treat, let me tell you what! 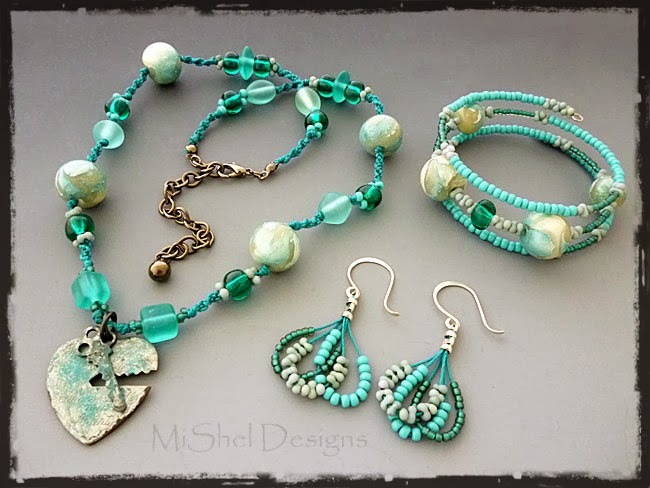 I truly enjoyed designing with Jeannie's beads and pendants. They helped me step out of my design box a bit and try new colors, new materials and different styles - it felt good. And challenging, too. So, in Jeannie's recent email, she asked me if I'd be interested in designing something with a few of her new beads she just 'perfected' to look exactly like lamp-work glass beads. When I opened the package Jeannie sent me (which itself was a work of art!) I was delighted to find these beautiful beads staring back at me. See what I mean - lovely!! 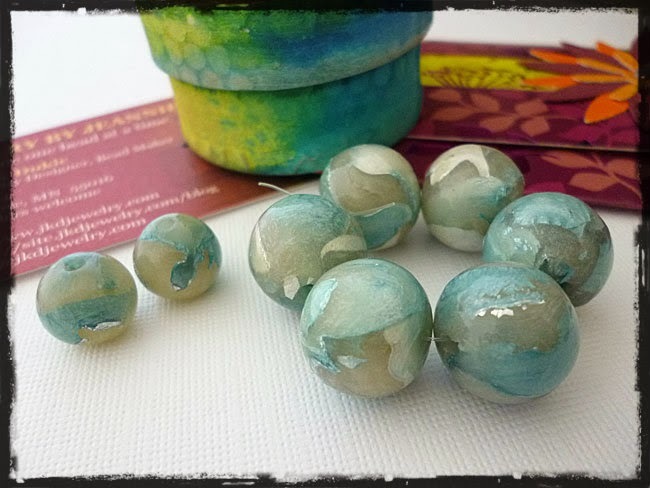 They really DO look just like lampwork beads!! I was excited at their beautiful blue color. They remind me of aquamarine blue and the color of the sea. 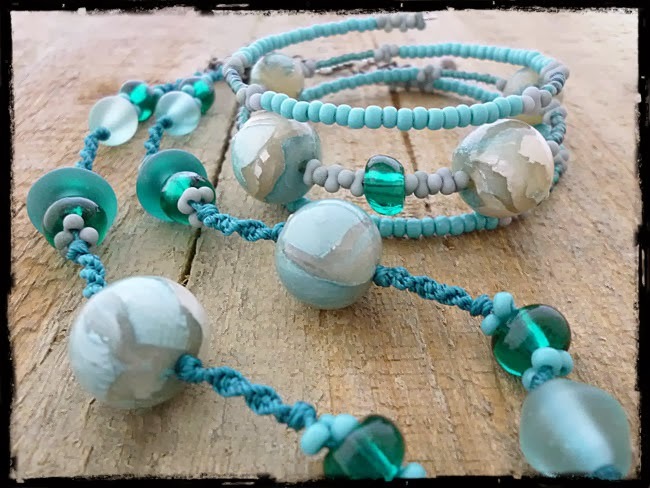 I tried to put some of my aquamarine stones with them - but what I had in my gem stash just didn't go with these beads - mine were too 'green' or something,....not what I had envisioned. To me, these beads were screaming "Sea!! Ocean!! 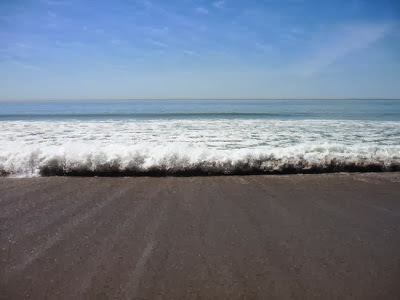 Waves!! 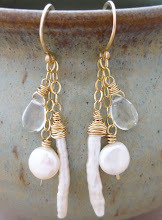 ", so I got out some of my glass beads that look like beach glass and went to work. 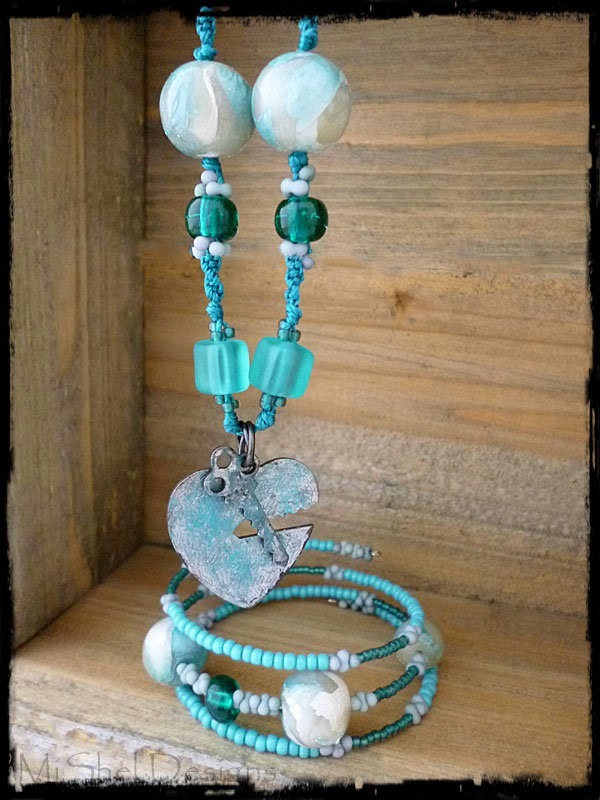 I grabbed some C-Lon cord (beadshop.com) in Turquoise and did a bit of macramé to mimic the 'wave' feeling I had with these and added some various sizes and shapes of seed beads in different shades of blues to the glass beads for some contrast in size and texture. I know, I know,...you're all shocked that I actually HAVE seed beads aren't you? Well, truth be told, I have two little 'bins' completely full of them. Why? I don't know. Food for the vacuum, I guess. I can hear it squeal with delight from the broom closet each time I get the bins out. Lord knows that other than stringing them (and I don't even do that very well! ), I could never work with these little rascals. I have such admiration for people who work with them. I mean seriously, the art they create with these tiny little things just amazes me. 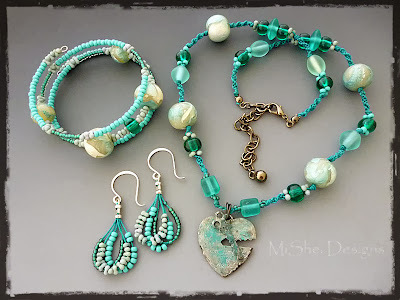 Anyway, I got in this 'zone', if you will, while creating with Jeannie's perfect polymer beads and here's what came of my creative session. Jeannie's new beads are called 'Polarity Beads' and they are a dream to work with. So light and versatile. That's one of the main things I like about polymer clay pieces (other than the fact that they can actually look like any other material on earth), - their weight - or lack there of, actually. It helps when designing pieces so you don't have to have objects of equal weight on the other side to balance the bracelet or whatever you're designing. And, for earrings, these beads would be perfect because they can be larger, but not have the over-the-top weight of some glass beads - thus not weighing you earlobes down. Yeah!! 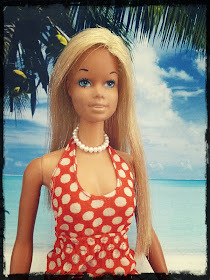 I used this little Heart/Key charm from B'Sue's Boutique as my focal for the necklace. You can't really see the inscription - especially since I used some gilder's paste (also from B'Sue's) over it - but it says: "He who holds the key, can unlock my heart"
Well, the sea holds the key to my heart. I truly enjoyed creating with Jeannie's new beads and using them as the inspiration for this set. I guess you could say they unlocked a sort of 'key' to a certain area of creativity for me! by Jeannie of Jewelry by Jeannie. 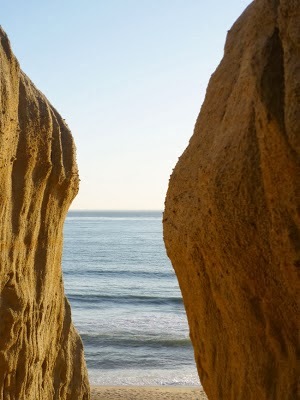 I hope you get the chance to hop on over to Jeannie's shop and check out all her other lovelies! I personally have my eye on one of her newer Acanthus Pendants (the blue one will go perfectly with some of my Ancient Roman Glass Beads from both Happy Mango and Philip Mertens). Peace, Love and Keys to Creativity! I know what you mean about seed beads, I have a love, hate relationship with them and I so admire the bead weavers. "I guess you could say they unlocked a sort of 'key' to a certain area of creativity for me!" That is beautiful Michelle and you have truly touched my heart. The colors and texture in these pieces are incredible. Back at ya, Jeannie!! 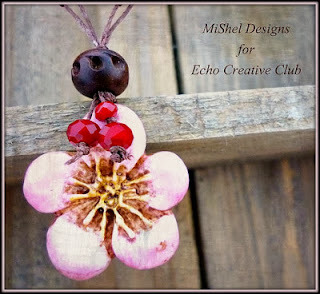 ;-) I love the jewelry you create with your beads and pendants. It's always so fashion forward and hip! I do like the macramé with these new Polarity Beads because it really shows off how shiny and brilliant they are! 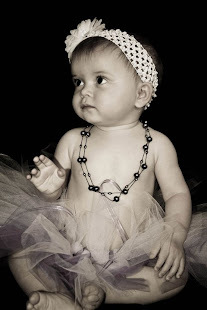 And the 'swirls' in the beads are just dreamy to look at! You're a master at polymer! Thank you so much for the opportunity to design with these beautiful beads! Jeannie's beads are gorgeous and they really do look like lampwork beads!!! The pieces you made are so beautiful. They do remind me of the sea. Thank you Alice! And yes, they really do look like lampwork beads. The pictures do not do them justice either - you should see them up close and in person - super wow!! Wow, Wow, Wow. What a terrific job you did with these beads and what terrific beads. I love the heart and key and the subtle blues that you combined. Great job. Beautiful work as always. Look at you going all seed beady on us! You done great!! LOVE these, and it shows a whole other side to you Shel! more! more! Lovely design. 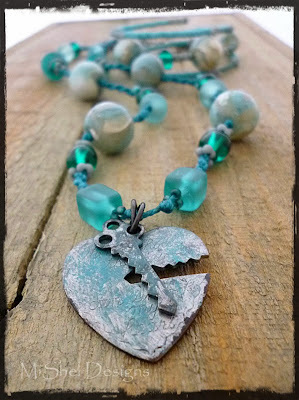 I love the crack in the heart and the beads are to die for! So lovely! The colors just sing!